November 5, 2016|Posted in: Let's Eat! 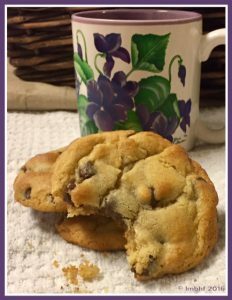 I recently bought a bag of chocolate chips and followed the recipe on the package to make cookies. When I pulled them out of the oven they were flat and limp with crunchy over-cooked edges and soggy middles. 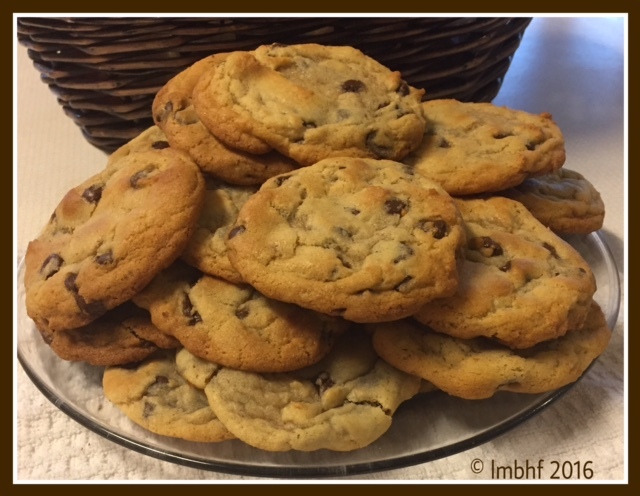 So I went to work experimenting with the ingredient amounts andI came up with the perfect combination to produce Chocolate Chip Cookies that are BIG, SOFT, CHEWY and DELICIOUS!! 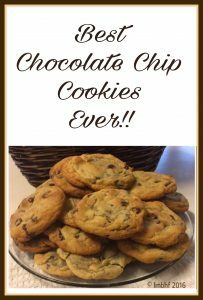 – You’ve gotta try these! Using a hand mixer combine sugar, brown sugar, butter and vanilla. In a separate bowl whisk together flour and baking soda. Using a spatula or a wooden spoon, slowly stir the flour mixture into the sugar mixture, stirring until well blended. Place large, heaping spoonfuls of cookie dough onto a baking sheet, spacing them 2” apart. Bake for 8 – 10 minutes, until the tops of cookies are golden brown and the centers are still soft. Allow to cool & ENJOY!!! Makes 2-4 dozen depending on size. Big, Soft, Chocolate Chip Cookies – Best Ever!